WIELS = contemporary art center located in a diverse popular neighborhood of Brussels. 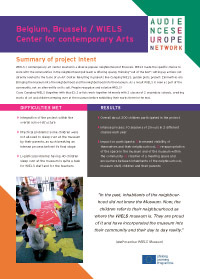 WIELS made the specific choice to work with the communities in the neighborhood (outreach & offering space), thinking "out of the box": setting up actions not directly related to the tasks of an Art Center. Resulting in projects like Camping WIELS, garden plots, project: Zimmerfrei, etc. Bringing the Museum into the neighborhood and the neighborhood into the Museum. As a result WIELS is seen as part of the community, not an alien entity on its soil. People recognize and valorize WIELS! 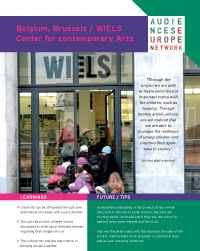 Case: Camping WIELS (together with Mus-E): 2 artists work together intensely with 2 classes of 2 secondary schools, creating works of art and children sleeping over at the museum before exhibiting their works there in the end.